Chromecast Audio gets hi-res music and multi-room support | What Hi-Fi? The latest software update for Google’s audio streaming hockey puck brings a couple of new features to “elevate your listening experience”. We’re inclined to agree with that comment, as the the update adds support for 24-bit/96kHz lossless audio playback meaning hi-res audio tracks can now be streamed to their full potential, not to mention CD-quality tracks and services such as Tidal. Before the update, the highest supported bitrate was 320kbps. 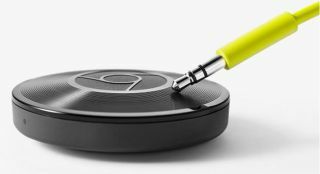 Google has also turned the Chromecast Audio into a multi-room platform as you can now stream the same song to multiple devices and speakers. Through the Chromecast app, you can group multiple devices together and stream to it in the same way you’d stream to a single Chromecast Audio unit. The latest Chromecast Audio update should be installed on your device(s) automatically, provided it's left plugged into power and connected to a wi-fi network. For more information, head to the Google support page.